Visitors | Rejoice in Art! Welcome to Rejoice in Art! 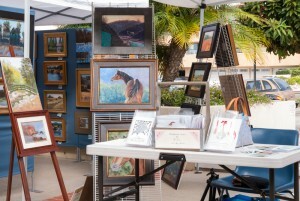 Riviera UMC’s annual fine art fair and exhibition. We are pleased to present this dynamic art event to the community for a fifth year, October 12-13, 2019. Please check back again soon for more information. Our 2018 weekend art fair was sold out — featuring 30 artists in tents and booths covering the upper and lower levels of the property. We also continued our national juried exhibition “For the Beauty of the Earth 2018” which received a record 300 entries, and was on view for two more weeks. Add to that three artist demonstrations, six musical performances, a 37-piece opportunity drawing and a beautiful artisan boutique, and you can see why we had all the makings of a fabulous event! Proceeds benefit Riviera UMC’s mission projects and its art and music programs. Riviera UMC is a 501(c)3 non-profit organization.